When you think of The Christmas holidays, you think ofChristmas markets but also with tasting the best Parisian restaurants. Here are some addresses of restaurants to test with your family or friends during Christmas. A dinner aboard the flies boats to celebrate Christmas. You can enjoy a meal for two on the 25th of December for 90 euros with appetizer, starter, main course, dessert and wine. You can also enjoy a cruise aboard the Parisian boats of 2:30 the evening during the Eve of December the 24th between 145 and 220 euros depending on the service including an appetizer, a starter, a main course, cheese, a dessert, drinks and wine. It is located on the rooftops of the Champs-Elysées with a view of the Effel Tower. You will taste for 135 euros a menu with oysters, foie gras with whiskey, guinea fowl and Christmas log. Lunch formulas are between 50 and 60 euros. It is located within the Opera Garnier. You will enjoy a meal for 88 euros per person on December 24th. It is surrounded by a chic decor dating from the 19th century. The restaurant also offers brunches and a valet parking. It is located near from the Champs-Elysees in the 8th neighborhood. this traditional restaurant with beautiful decor offers a tasting menu for 55 euros with chicken supreme or snail laminated among others. This cabaret and Parisian restaurant is located in the 15th neighborhood and offers both shows and entertainments as well as formulas for lunch or dinner including a grilled cockerel or vacherin iced between 53 and 78 euros. 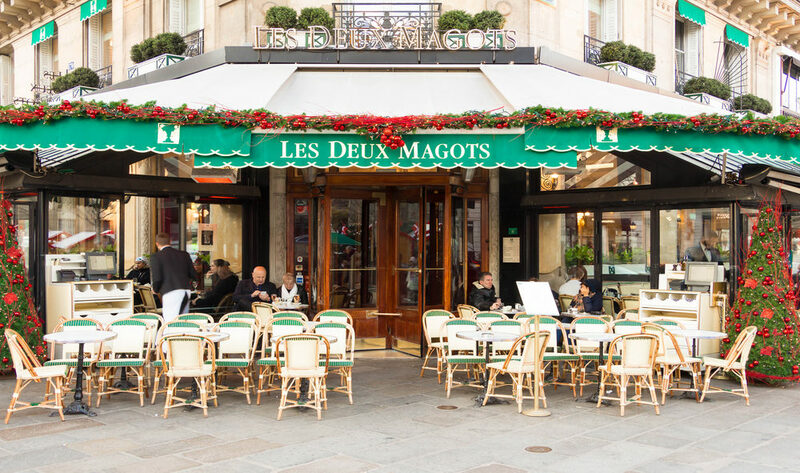 This chic restaurant is located in the sixth neighborhoodt in the district of Saint-Germain des Prés and offers a formula between 50 and 70 euros including scampi and cream morels and a vacherin iced. This restaurant can welcome 220 covers and is overhung by a glass roof of 12 meters.